If we’ve learnt anything over the last ten years, it’s that under no circumstances should we let our sensitive personal finance and banking details roam free online - or anywhere else. So, the news that our bank accounts were to be opened up to third parties and transaction data shared around, seemed - on the face of it at least - a bit nuts. But that’s precisely what happened in 2018. The result? Probably the biggest win for bank customers in decades, with vastly improved, personalised services and more choice than ever before. And for that we have PSD2 and Open Banking to thank. PSD2, or the second Payment Services Directive, was introduced at the start of 2018. It forced banks to share data between themselves and (approved) third parties so new challengers and disruptors could more easily enter the market. It looked like good news for customers. Services, the argument ran, would be more integrated and personalised, data simpler to access and manage, and existing payment processes would become more streamlined. Transactions would be safer, faster and more transparent. Is PSD2 the same as Open banking? A question worth clearing up. The answer is almost. Whereas PSD2 requires banks to open up their data to third parties, Open Banking demands they do so in a standard format. Think of Open Banking as the UK version of PSD2. Through standardisation, there is less chance for things to go wrong. It’s not meant to be a free-for all. But, ultimately, transparency is the key to open banking. Because everyone if forced to maintain high standards, with so much competition for your business. What can I do now that I couldn’t before? The real genius of PSD2 lies in the delivery. The legislation may be dull, but the end-results, elegantly rendered on smartphones are extremely pleasing. Stylish in-app tools present a much clearer picture of your spending habits, often across multiple accounts, so you can control, budget and save in clever and interesting ways, while barely lifting a finger. You can see what you’ve spent, where you’ve spent it and how often, across several different categories and types of account – all from one happy place. Not all apps coming to market carry their own bank accounts, of course. Many assume the role of money mentor, or financial guide. All, however, are capable (to some degree) of working away in the background, identifying and clarifying the patterns and behaviours that sit behind our spending choices. By bringing bank and savings accounts together, you’re getting a vastly more useful and coherent snapshot of your finances. Often in close-to real-time. Plus the need to switch too regularly between banking apps is removed entirely. With some financial apps, you can monitor the finer details of a particular part of your finances and spending. Or you can trim your bills and free-up money from somewhere else to meet those more expected and eye-watering expenses, like a clapped-out boiler or run down car. These type of smart tools mean you have more chance of keeping your hard-earned for things that matter, too. Some apps will help you identify what those life goals are, whether short-term or more aspirational. By giving the high street the bird in favour of palm-of-your-hand smart accounts, customers can aggregate their cash flow and, in many cases set spending limits, change PINs and personalise how they access their accounts or pass security. You’re getting the services you want without the baggage and noise you’re used to from a bank – plus of course it means no branches, no queues, far less red tape and virtually no paperwork. PSD2 and Open Banking have allowed the next generation of banks to showcase a host of new services - provided, of course, you’ve consented to sharing your banking data. This is a key point. 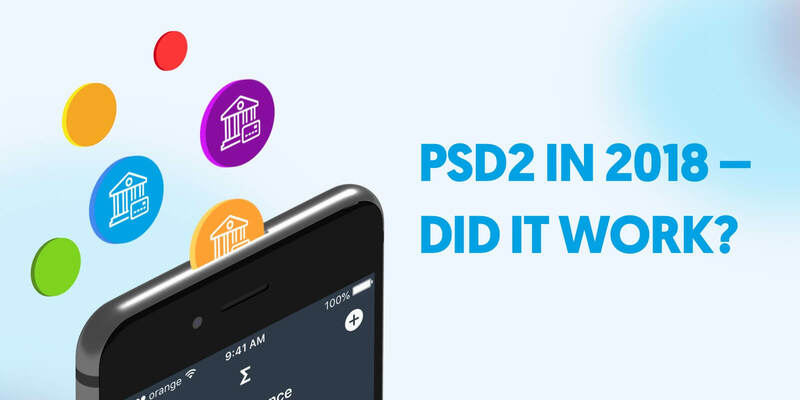 PSD2 makes consumers safer because it forces financial services providers to take the integrity of your data much more seriously. Sure, services are smarter, more convenient, more touchy-feely and more personalised - but they’re also more secure. Biometric security features like Voice ID, face recognition, short video recording and fingerprint tech work in unison with ‘in app’ features like one-touch card locking and customisable withdrawal limits to keep your money safe. 21st century account security is multifaceted and multi-layered, but crucially extremely easy to deploy and set up by new users. On top of this, all providers must comply with secure customer authentication and data protection rules - including new GDPR regulations that came into effect in May 2018. Banks must tell customers exactly which data they will use, how long for and what they will do with it before they sign up. Can PSD2 be defined a threat to the big banks? There’s no doubt PSD2 has put a rocket up established banking practices and blown open opportunities for competitors and innovators to march into the space usually occupied by the big boys. It’s also fair to say the new players have wasted no time, too. Everything is now being viewed with fresh eyes, and individual customers have been placed front and centre for the first time. Finally, the banks are being given a run for their money. Tech companies have also been able to beat up the banks, because they come with deep experience of app build and immersive user-experience. It has forced traditional banks to raise their game - and lower their prices. PSD2 has been a headache for them. As well as needing to get the regulations right, they’ve had to transition systems while tackling the challenges of interoperability. These market giants rely on legacy infrastructure, which makes implementing new systems incredibly difficult to achieve. As well as new breed of bank, they also face a new breed of customer; one who pays more attention to service than status and are will judge you on merit and behaviours. One who will go somewhere else if needs be, demand transparency and expect you to champion environmental responsibility and ethical practices. They can afford to be picky. Of the big banks currently rolling out improvements to their apps, making enhancements or (in one or two cases) applying panic patches, some are faring better than others. I’m naming no names. But you can below, if you like. For years, banks have enjoyed a kind of lazy loyalty from customers who found it difficult to swap providers or couldn’t see any real benefit. There’s been a fundamental lack of differentiation and competition in the market for too long. Thanks to PSD2, that’s changing. New providers are entering the market every month, driving innovation and upgrading the customer experience. The positive impact of PSD2 and Open Banking will be felt for decades, as consumers finally get the banking services they deserve.